The Regal Edition of the Roman Missal, Third Edition, has been designed to ensure that every element is durable and practical—yet dignified, beautiful, and suitable for divine worship. The instruction concerning an altar missal from the Congregation for Divine Worship and the Discipline of the Sacraments states it “should be marked by such a dignity that the exterior appearance of the book itself will lead the faithful to a greater reverence for the word of God and for sacred realities” (Liturgiam Authenticam, 120). For this reason the quality of paper and binding as well as the visual impact of vibrant, full-color illustrations; musical notations; and fonts for texts have been considered to produce a dignified altar missal. 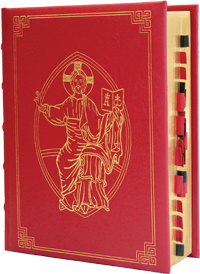 The missal is bound in genuine leather, bearing the gold-stamped image of Christ Pantocrator to reflect the dignity of the liturgy. The Smyth-sewn binding and robust, embossed end sheets allows the missal to lay open and hold up to everyday use. Full-color illustrations from the Church's treasury of fine art adorn the seasons and principal feasts of the liturgical year. The gilded edges are struck with red and then gold to preserve their beauty even when the book is laid open. The prayers are printed in black with red rubrics on august cream paper. The 24 tabs are made of genuine leather and firmly attached to the page to facilitate the turning of pages and prevent tearing. The gold-stamped Florentine edges on the inside of the cover testify to the attention to detail employed throughout this missal. The six ornate ribbons are custom-made with a slug so they do not damage the pages or binding. The cream-colored, 60 gsm paper are thin enough to maintain a manageable weight but sufficiently opaque to ensure the clear legibility of the text. Pages used more often utilize thicker, 100 gsm paper to ensure their durability. The protective, red, cloth-wrapped box safeguards the missal from being soiled or damaged when not in use. **The Roman Missal, Regal Edition, was printed in 2011 and in June of 2013 the name of St Joseph was included in Eucharistic Prayers II, III, and IV. Every purchase of this missal will include a set of stickers to apply to a specific stanza for Eucharistic Prayers II, III, and IV. If you already have a Roman Missal, Regal or Classic Edition, and wish to have a set of these stickers, please let us know here. To review a sample of the liturgical art, click here. To review a sample of the text layout, click here.